Get geeky and help the environment at the same time. – With surveys suggesting the number one thing people want for Christmas once again being a computer, it makes good eco sense to think green. Dell Computer is, recently announcing an initiative to make Dell Computers more eco friendly. As the second largest computer maker in the industry, Dell is taking their leadership position very seriously and should be rewarded by those looking to buy a PC for the holidays. In addition to creating more energy efficient computers, Dell plans to also lean on their their suppliers to follow their lead. And if they don’t, Dell may levy penalties to motivate them. Although their pledge mostly relates to becoming carbon neutral in their manufacturing processes, it’s a start, and makes Dell the first major computer manufacturer to seek to become carbon neutral by next year. – With a wind up lever to provide a human powered electrical charge, the Eco Media player is about as green as you can get. One minute of winding gives up to 40 minutes of play time to listen to your favorite tunes, or watch your favorite movies or still photos on the postage stamp size LCD color screen. It also comes with an FM radio and even the ability to read eBooks. It also comes with 2gb internal memory which is expandible thanks to it’s SD card slots. Media files are easily installed by a simple “drag and drop” rather than taking time to synch the unit with some proprietary music software, so it’s easy to use. Built in microphone for voice recorder function, super bright LED flashlight, audio line in function for MP3 recording of external sources and users can even charge their mobile phone in a pinch. And even though it runs on windup power, the Eco Media Player does have an alternate Internal Lithium Ion battery which can be recharged via USB port, or the winding mechanism itself. You can get a maximum play time of 20 Hours on each charge. This player is well thought out, though a tad pricey at $340 US. 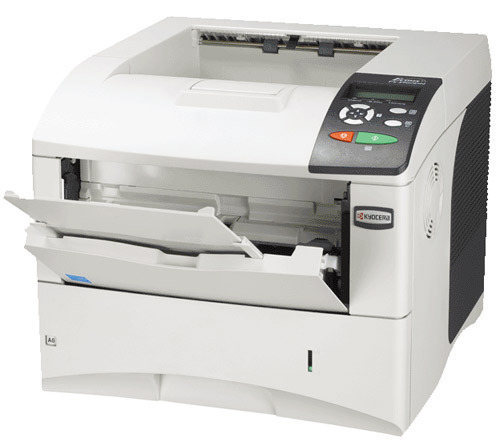 – The Kyocera FS-3900DN laser printer touts 100% ozone-free operation. It uses a positive electrical charge applied to recycled printer rollers to fuse toner and reduce emissions to near zero. It features a 500-sheet standard paper drawer, 64MB of RAM, and USB host printing. Even the plastic toner cartridges are recyclable. Still, with laser printers plummeting in price, the near $1,000 price tag is dizzying. I guess we all have to suffer for the greater cause. – During the Vietnam war, US fighter planes had a gun pod that was powered by a wind turbine which would pop out and power the gatling gun used in aerial engagements. Sadly, the turbine was also prone to jamming at the wrong time, prompting US Aviation companies to look internally to power their firearms. But the idea of using the wind to provide electrical power has landed where it belongs … in the computer electronics world. 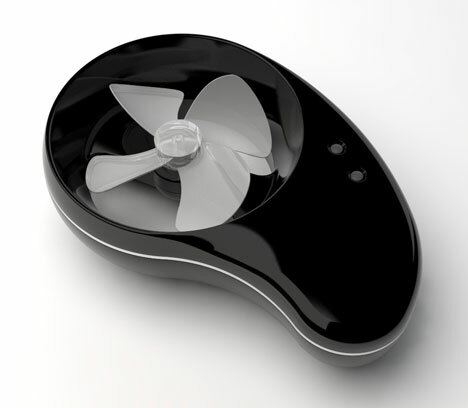 The HyMini Wind Powered Charger captures the wind to provide 5v of power to recharge all kinds of gadgetry including iPods or cellphones. Users can set it to capture the wind just about anywhere it blows or can harnass the power of the slipstream provided outside an automobile or while riding a bicycle (using the armband) to charge their batteries while travelling. Get the car up to 40 mph, and you can provide enough power for 8 hours of mp3 playing or just over a half hour of active cellphone talk time. And if the wind dies down, all isn’t lost as the HyMiniSolar cells can interface with the turbine to provide solar power as well. The Solar cells can also be daisy chained to increase capacity. Comes in Black, White or Green and costs about $50 for the Mini, and $25 for the recycled cardboard encased solar panel. – Every year, gadget users toss billions of depleted batteries into the world’s landfills. Users are steadily embracing rechargeable batteries as their life improves and their charge increases in power, but to date, it only consumes about 10% of the power market. 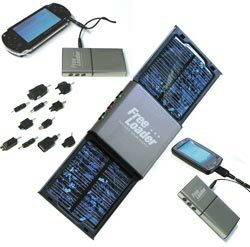 And users still have to bring along the AC Adapter/charger to power them up. Until now. 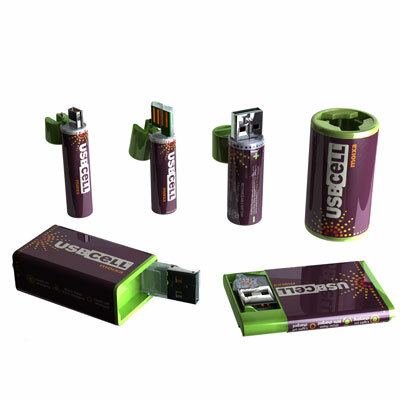 Moxia Energy USB Cells have a USB plug built into them so users can simply plug them into their PCs and juice em up. Nominated for a National Energy Efficiency Award, the USB Cells are expanding from the original AAs, into C, D, 9V and mobile phone battery designs. The Nickel Metal Hyrdride (NiMH) powercells provide 1.2v 1300mah of power and can charge to 90% capacity in as little as 5 hours. They can also be recharged in conventional NiMh chargers, so if you have to turn off the PC, you can still charge your cells. 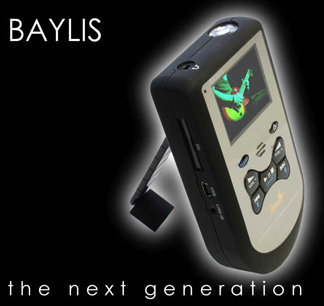 They can be used in cameras, game controllers, remotes … just about anything that takes a battery. – With gas hovering around three dollars a gallon (US), it only makes sense that more and more commuters would chose to get some exercise and ride their bikes to work and school. But with Daylight Savings time right around the corner (Sunday), most will end up coming home riding their bikes in the dark. When riding a bike, you need to be able to signal the cars behind you in traffic your intentions. Usually, you point to the right with your hand to turn right, point your hand in the air to turn left, and point down to your side to signal stop. But if you’re riding home in the dark, the cars behind you may not be able to see that. Enter BiCygnals. Made of super bright LED lights, BiCygnals consist of a set of left and right signal indicators connected wirelessly. The cyclist signals a left hand turn and the rear Cygnal reacts wirelessly in concert with the front signal, which is triggered by the cyclist. Also included is a bright red stop signal to let them know you’re slowing down to a halt at the next stop light. And the LED front rack also comes with a very bright rack to light your way. BiCygnals are powered by 4 ‘AA’ Batteries in Front Unit and 4 ‘AAA’ Batteries in the smaller Rear Unit. They even have a low battery warning light so you can slip into a nearby store to reload on the way home (too bad it isn’t pedal powered). The oval-shaped BiCygnals clip together and fit into a nice carrying case for easy storage and cost a very affordable $84.00. Power em with USB Cells and you’re cookin’ with gas.